Papers Co-Chairs Bergame Periaux, Thomas Goerne, Wolfgang Klippel, Robin Reumers and Dejan Todorovic are hard at work reviewing submissions for a series of sessions covering most of the principal areas of research into audio engineering and practice. We have also received at least twenty proposals for Workshops and Tutorials, which are now under consideration by Co-Chairs Natanya Ford and Rob Toulson – and proposals are still coming in. The closing date is 10th February, so you still have time to get your ideas into the stream. In preparation is a unique series of Workshops and Tutorials on the multichannel and 3D audio reproduction environments, along with binaural listening (the BiLi project), with contributions from Auro 3D, BBC, Conservatoire de Musique de Paris, France Televisions, IRCAM, Orange Labs and Radio France, to name just a few. Keep an eye on your inbox for updates and info, as more details of the Technical Program are announced. Student activities will be a major part of the Convention Program, with most of the student sessions taking place in the Havane Amphitheatre at the Palais des Congres. Don’t worry, there are no stone seats in this amphitheatre, it has all the comfort associated with a first-class Convention Centre. Most of the student activities such as the Student Delegate Assemblies (1 & 2), the Student Recording Competition (1 & 2), and the Critical Listening Sessions will take place in the “Havane,” and for the first time a workshop will be organized on “European Audio Education: Possibilities & Challenges.” The popular Educational Fair is also part of the program, as is the Student Design Competition, for which record submissions are expected. The Convention Committee is also planning a new innovation under the banner “Audio Projections.” No challenging scientific concepts to get your head around, just a pure listening experience at the end of the afternoon when all you want to do is to sit down and relax. Within this track will be a series of multichannel or 3D audio projections, with contributions from Morten Lindberg (2L, Norway), Hugo Romano Guimarães (Neu Records, Spain), Wilfried van Baelen (Auro 3D, Belgium), Michael Williams (France), and – this one will set you thinking – “The world of the Dinosaurs,” based on the work by Prof Weishampel (Johns Hopkins School of Medicine, USA) and Jean Luc Herelle (bio-acoustician and natural sound recording engineer in France). The Exhibition Sales Team is also hard at work bringing together important and interesting exhibitors who will showcase the latest in audio technology and practice, and of course the Project Studio Expo and Live Sound Expo, along with a new Broadcast Forum, will again be organized on the show floor. 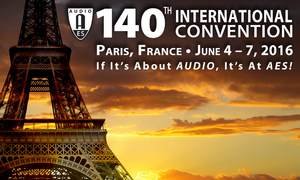 This is all designed to ensure that the AES 140th Convention will be the audio event of the year. 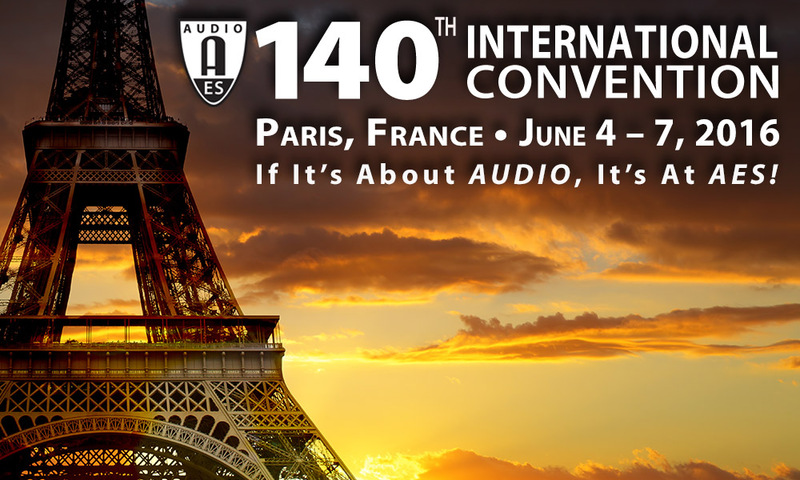 For the latest information on other upcoming AES events around the world, visit the AES Events page or find out more about the Audio Engineering Society at aes.org.